4 Bedroom Detached House For Sale in Bedford for £545,000. 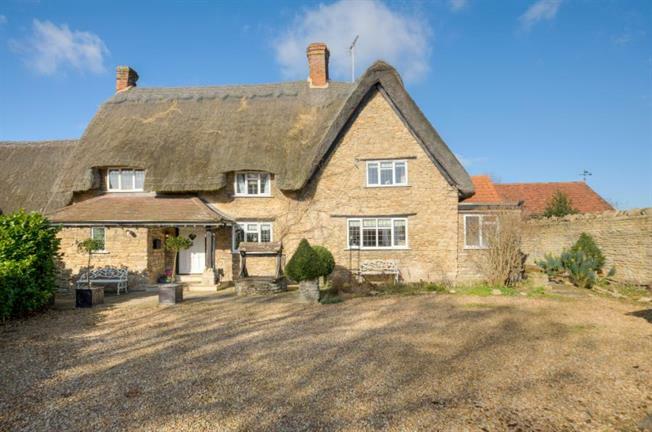 This is a stunning Grade II listed former farmhouse stone under thatch, dating back in part to the 15th Century. There is accommodation over two floors including a large entrance hall, refitted kitchen and pantry, as well as a family room. Further benefits include a large sitting room with doors to the garden and a beautiful fireplace. The ground floor also includes a cloakroom and a further office / 4th bedroom and the layout creates the versatility of an annex. The first floor offers three double bedrooms, one with an en suite shower room and also a refitted family bathroom. There is a huge amount of character throughout the property including inglenook fireplaces, exposed stonework and beams. Externally there is a double detached garage, a long gated driveway and a large private rear garden with a veg plot, patio and lawn.